The AG-HMC150 handheld is Panasonic's exciting new introduction to the AVCCAM series. Representing a major step forward in affordable HD video capture, the HMC150 utilizes highly efficient AVCHD recording, the industry's new long GOP standard based on MPEG-4, to provide stunning image quality and longer record time. The new handheld incorporates three 1/3-inch progressive CCD imagers to produce stunning 1920 x 1080 resolution picture quality far exceeding older Long GOP formats like HDV. It's equipped with a high-performance wide-angle* Leica Dicomar™ 13x zoom lens and 24- and 30-frame progressive capture in a full range of HD formats, making it well suited for all types of projects. With an exciting range of professional video and audio features and a compact, well-balanced design, the HMC150 is a "must have" for video professionals and enthusiasts looking for the best in affordable HD. Forget minutes! With AVCHD technology and high-capacity SD memory cards, the HMC150 provides hours of beautiful high definition recordings at professional bitrates up to 21Mbps. And it's as easy to use as a digital still camera, with simple playback on many consumer devices and players, from computers and video game consoles to Blu-ray players and flat panel displays with SD card slots. AVCHD is currently supported by variety of editing solutions including: Apple iMovie, Apple Final Cut Pro 6.0.1, Adobe Premier Pro CS3, Grass Valley Edius PRO v4.5, Pinnacle Studio Plus 11, Nero7 Premium Reloaded, Ulead Video Studio 11 plus and DVD Movie Factory 6 Plus. • Extra-long record times - one 32GB SDHC card can hold up to 3 hours in the PH mode mode, 4 hours HA, 5.3 hours at HG mode and 12 hours in the HE mode. 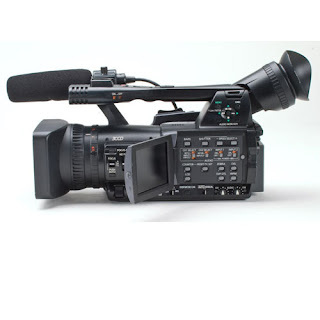 Item Reviewed: Panasonic AG-HMC150 9 out of 10 based on 10 ratings. 9 user reviews.